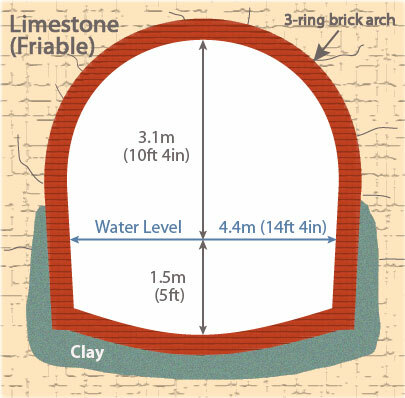 The graphic below shows a longitudinal section of the tunnel. The scale of the vertical axis is 7 times that of the horizontal to provide a more meaningful profile. The brown vertical lines represent approximate positions of tunnel construction shafts. Some of these are referred to as Air Shafts on Ordnance Survey maps. The blocks of grey shading within the tunnel denote areas of known wall and roof falls, with a total blockage near the Daneway end. 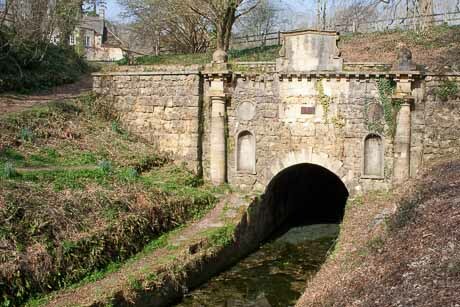 The length of Sapperton Tunnel is 3,490m (3,817 yards, 173.5 chains or 2.17 miles) and was completed on 28 April 1789. The nominal width is 4.4m (14ft 4in) with a minimum height of 4.7m (15ft 4in). The roof can be significantly higher in parts of the unlined sections, due to the amount of rock that fell during construction blasting operations. The Daneway entrance to the tunnel is 7.5 route miles (12km) from the start of the Thames & Severn Canal at Wallbridge in Stroud. The tunnel is on the summit (highest level) of the canal which is about 111m (360ft) above sea level, and has climbed 73.5m (241ft) from Wallbridge in Stroud. The maximum height of the tunnel overburden (ground between the tunnel roof and the surface level above) is about 66m (216ft). Probably the most architecturally significant structure on either the Stroudwater or Thames & Severn canals is the Coates Portal. The mainly neo-classical structure was in a very poor state of repair in the early 1970s. Fortunately, the Cotswold Canals Trust (as it is now known) raised the funding for restoration, and it was officially 're-opened' in 1977. Daneway Portal, built in the Gothic style, was also in a very poor state of repair with most of the battlements lying in the bed of the canal. In 1996 the Canal Trust again raised the funding to have the portal restored. 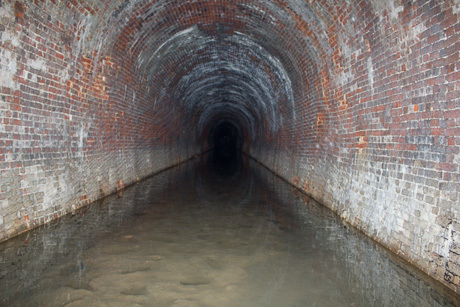 As can be seen from the photo below, there is no towpath in the tunnel. During the working life of the waterway, canal craft did not have engines. Instead, boats were pulled along the canal by horse, donkey or a man walking along the towpath. View looking in through Daneway Portal and a brick-lined section. It is just possible to see the first roof fall when standing here. To get a boat though the tunnel, one or two men would lie on their backs on board the boat and 'walk' along the tunnel wall or roof. This process was known as 'legging'. Another method used a pole to push the boat along, again using the tunnel wall or roof. However, this method was forbidden by the canal company due fears that the masonry might be damaged. The distance through the tunnel is recorded on 'chain' marker plates fixed to the wall. The distance between plates is one chain, an old English measurement for 22 yards (20.3m). The 73 chain marker - 1,606 yards (1,482m) from the Coates Portal. Somewhat perversely perhaps, the distance marked on these plates increments from east to west, whilst on the canal milestones the distance increments from west to east. As might be expected after over a century of being abandoned and unmaintained, sections of tunnel wall and roof have collapsed. Areas worst affected by falls are marked on the tunnel graphic above, and these are predominantly in sections of Fuller's Earth (see below for more details on the local geology). There are more photos of inside Sapperton Tunnel here. 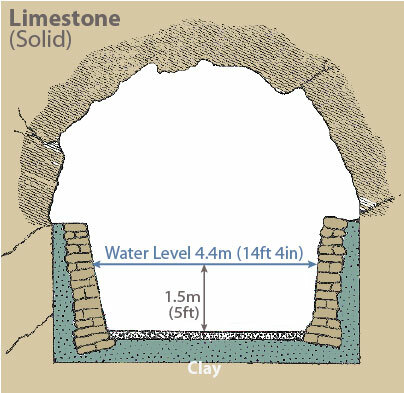 Sapperton Tunnel is cut through a number of different types of Sedimentary Bedrock which formed during the middle (Bathonian / Bajocian) Jurassic Period. The local environment was previously dominated by shallow seas. The graphic below gives an indication as to the type of geology the tunnel passes through, as represented by the different background colours. Note the vertical fault line not far from Sapperton. The different types of bedrock fall within two Geological Groups; Great Oolite and Inferior Oolite. These rocks were formed approximately 164 to 169 million years ago. Formed approximately 164 to 177 million years ago. Birdlip Limestone Formation - Ooidal Limestone. Formed approximately 177 to 180 million years ago. The graphic above, however, does not give the whole story as the bedrock formations along the route are laid down in different strata. So for instance, a formation of stable Forest Marble (Cotswold Stone) can be over a formation of very unstable Fuller's Earth (clay). Tunnel construction started in late 1783 and was completed in 1789. The work involved several different contractors. Work began by setting-out the tunnel route on the ground. A number of vertical shafts were then dug along the route to the required depth. The shafts were about 2.4m (8ft) in diameter and it is believed that 26 were sunk in all. The depth of these varied from about 69m (226ft) to less than 10m (32ft). The approximate locations are shown on the tunnel section graphic above. 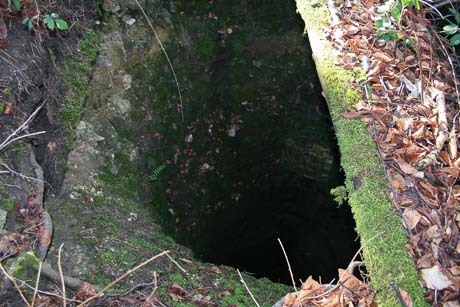 One of the shafts was abandoned before reaching the required depth, probably due to flooding. From the base of each shaft, a 'heading' (small tunnel about 1.2m (4ft) wide and 1.8m (6ft) high) was cut in two directions - along the tunnel line (see picture below). Headings were also cut in from what would become the tunnel entrances. 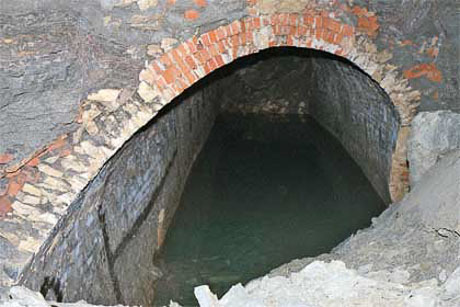 Once headings had been connected, and the alignment checked, the tunnel was excavated to its full size, and lined with brick or stone where required. Spoil from tunnel excavations was raised up (most of) the tunnel shafts by man or horse and deposited around the shaft head. Alongside the road to Sapperton from the A419, a number of these spoil heaps can be seen today. These now have mature beech trees growing on them. The photos below show an open shaft, and a view looking into it! Needless to say, open shafts are extremely dangerous although these are fenced off. However, not all the 'closed' shafts were actually filled-in, some were merely sealed with a wooden cap, and then covered with soil. Dish-shaped depressions about 8ft (2.4m) in diameter in the ground on or near the tunnel line are best avoided! 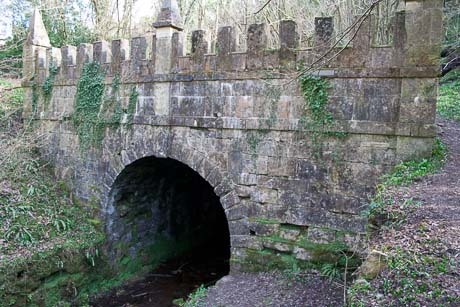 Sapperton Tunnel is a 'horseshoe' tunnel, in that the tunnel walls slope inwards slightly as they approach floor level. The name being derived from the shape of the cross-section (See Figure 2 below). The illustrations below show the different types of construction used for each type of formation. The tunnel was constructed entirely by hand using simple tools and equipment such as picks, shovels and wheel barrows. In addition, significant quantities of gunpowder were used to blast the rock. 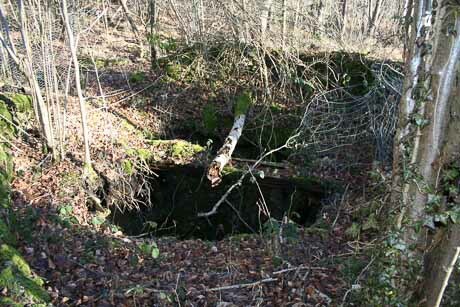 Spoil was removed either by raising it up the tunnel shafts or directly out of the tunnel entrances. Lighting in the tunnel during construction would have been provided by candles or simple lamps; the same for boats later passing through the tunnel. Issues of poor workmanship were recorded during construction. One of these was where only one ring of brick was used in sections of the 'long arching' (see tunnel graphic), where three was specified. There is no evidence, though, that this problem still exists today. However, the most significant issues by far were Fuller's Earth and water! 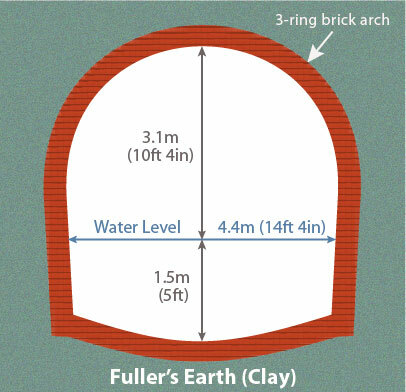 Fuller's Earth, being a clay, has the property of expanding when wet. This is not a good situation within the tunnel, as this had a tendency to put extreme pressure on the brick and stone structure, resulting in significant distortions of the side walls and roof, and eventual collapse. There was also a major impact on the brick invert (tunnel floor), as this same pressure pushed the invert up so much that there was as little as 0.6m (2ft) of water in places at times. To overcome this, a major program of work was undertaken to remove the invert in the worst affected sections, and replace it with timber stanchions across the tunnel to keep the walls from moving in. The positions of these are marked by black painted circles on the tunnel walls. Today, many of these 1ft (0.3m) diameter stanchions have 'snapped' and been pushed-up above the floor level of the tunnel. (It is probably the raised floor that is now preventing the walls from moving in). 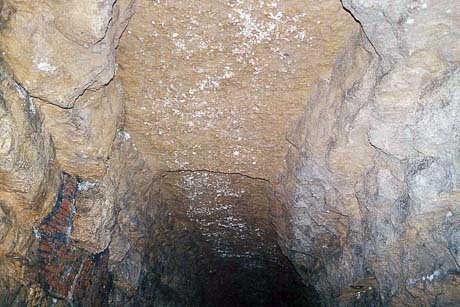 Rain water percolating down through the ground gives rise to a number of springs inside the tunnel. These are a valuable water source on the canal's summit where feeders (water supplies) are few and far between. 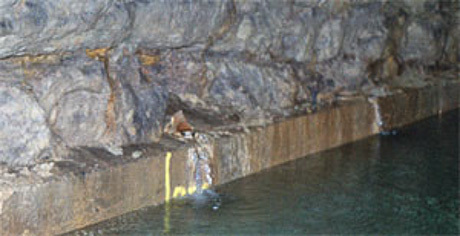 Springs have, however, been the cause of problems throughout the tunnel's history. These occur when water forces its way up through the clay lining in the canal bed. When the spring later dries-up, after periods of low rainfall, water from the canal then drains down through the bed via the same route. 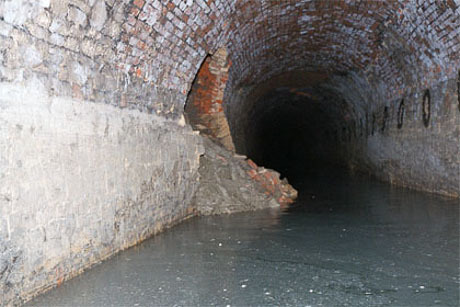 One solution, as late as 1904, was to line vulnerable parts of the tunnel with concrete, and provide spouts for the springs to discharge into the canal above the water line, as shown in the photo below. The Tunnel is privately owned, and unauthorized access inside is not permitted, not least for safety reasons. The eastern end is also home to a small number of bats, which are a protected species. The Cotswold Canals Trust do, from time-to-time, conduct informal surveys inside the tunnel to assess its condition. The last of these was in November 2008 which entered from the Coates end. A report of the trip, which appeared in the spring 2009 edition of The Trow, can be downloaded here. 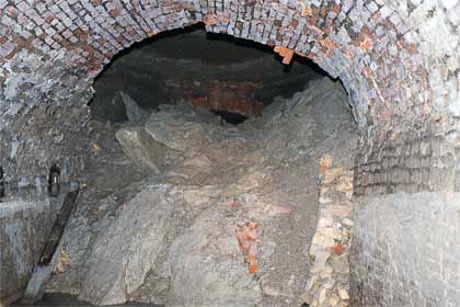 A team from Cranfield University surveyed the Daneway end of the tunnel in 2005. This confirmed the presence of 3 falls, the last of which completely blocks the tunnel. The restoration of Sapperton Tunnel is entirely feasible from an engineering standpoint. As might be expected though, this will be the most complex and expensive single element of the Thames & Severn Canal restoration.